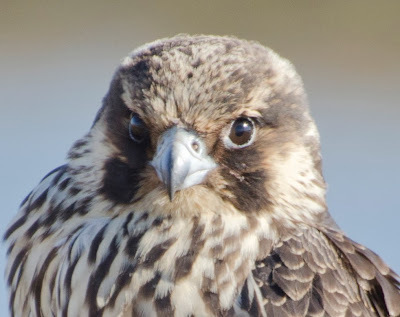 An immature peregrine falcon, Falco peregrinus. 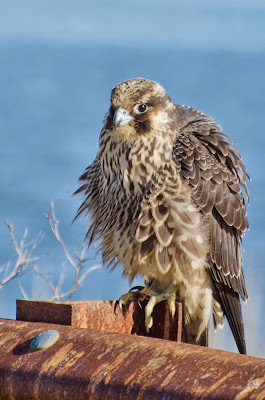 I saw this falcon at the Edwin B. Forsythe National Wildlife Refuge in Oceanville, New Jersey, on Christmas day, 2013. I would not have noticed it, but an adult peregrine circled around me. I looked at the ground where the adult had swooped lowest and I saw the young peregrine on the ground. I took the photo below. See how well it blends with the background? This bird hatched in spring 2013. Its cream and brown camouflage will be replaced this comming summer with the famous slaty blue plumage of an adult peregrine falcon. Click to enlarge. The sighting is something to celebrate. Peregrine falcons had been extirpated in the entire eastern United States by the 1960s. Western populations were estimated to have been at about 10% of historical levels -- there were just a few hundred known nesting pairs left. A series of conservation laws, culminating in the Endangered Species Act, targeted peregrines for protection. The Endangered Species Act was signed into law by President Nixon on December 28, 1973. Its 40th anniversary has just passed. 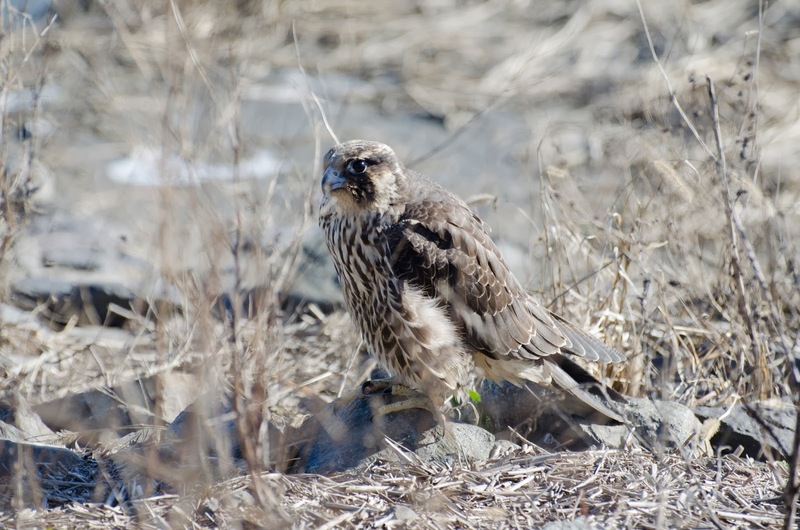 Protection and recovery efforts are working for the peregrine. The falcon was removed from the federal endangered species list and declared recovered on August 25, 1999. It is still listed as endangered by the state of New Jersey. Thanks to federal protections and local reintroductions, I saw a peregrine in New Jersey on Christmas. The first pair nested at Forsythe Refuge in 1980. There were about 25 pairs in the state by 2010. Fifty-seven young peregrines were raised there in 2013. Click here to read the New Jersey Department of Environmental Protection, Division of Fish and Wildlife, report on the Peregrine falcon for 2013.